This month we opened our brand new, all female adaptation of Whisky Galore, won three Manchester Theatre Awards for our 2017 productions, and held our third annual International Women’s Day with residents from New Charter and Aksa Homes. On Friday 9 March representatives from the Coliseum hopped on a tram and headed over to Salford Quays for the star-studded Manchester Theatre Awards ceremony held at The Lowry. The Manchester Theatre Awards is the most important theatrical prize giving outside of London, honouring productions seen in Greater Manchester during 2017. The Coliseum had 10 nominations this year and we were thrilled to join up with some of the talented actors who had been nominated for their performances on our stage for the ceremony. One of the biggest prizes of the night, the award for Best Production was presented to Kenneth Alan Taylor and the Coliseum’s Associate Director, Chris Lawson. The Coliseum produced the North West premiere of The Father in June-July 2017, directed by Chief Executive and Artistic Director, Kevin Shaw, and starring actor, director and twice former Artistic Director of the Coliseum, Kenneth Alan Taylor, in the lead role of André. Our production received praise across the board, including four five-star reviews. Taking the audience on a journey through André’s perspective, The Father is a powerful and moving black comedy about the devastating impact of dementia on one man and the people in his life. The Father was originally written in French by literary sensation Florian Zeller and won the Moliere Award for Best Play in 2014. Translated into English by Christopher Hampton (Dangerous Liaisons), it earned a further string of accolades and nominations from hit runs in London’s West End and New York’s Broadway, including a Lawrence Olivier Award and a Tony Award. The Coliseum’s production adds a Manchester Theatre Award to that list. The Coliseum’s production of The Father was sponsored by Aksa Homes / New Charter Group. Kenneth Alan Taylor’s brilliant performance as Andre moved audiences at every performance. Throughout The Father we see André’s charming, playful and dark sense of humour shine through despite his weakening memory and increasing sense of worry. Kenneth Alan Taylor has performed in over 320 Oldham Coliseum Theatre productions since his first appearance at the then Oldham Repertory Theatre in 1959. He became Artistic Director from 1978 to 1982, reopening the theatre after a nine month closure and reconstituting the Oldham Repertory Theatre as Oldham Coliseum Theatre. He returned as Chief Executive of the theatre from 1996 – 2002 and was presented with the Horniman Award for Outstanding Achievement in Theatre in 1997. English Touring Theatre’s The Weir had a hit run at the Coliseum in October 2017. Winner of the 1997 Olivier Award for Best New Play, Conor McPherson’s chilling, modern classic is set in a small Irish town, where the locals exchange stories around the fire of Brendan’s pub one stormy night. The Weir came to the Coliseum as the second production to be toured to the Regional Touring Network, an Arts Council England Strategic Touring consortium of nine regional venues, with whom English Touring Theatre produce and tour high quality drama. It followed the success of English Touring Theatre and Orange Tree Theatre’s production of Terence Rattigan’s French Without Tears which toured in autumn 2016. “There is nothing like a ghost story or two as the nights draw in. and there is no better setting than the Oldham Coliseum, with the old world charm of the theatre setting the perfect atmospheric backdrop.” – Oldham Times. The 2018 Manchester Theatre Awards were in association with Target Live, who managed the PR for the awards. We opened Whisky Galore earlier this month, with a talented all-female cast playing the hilarious characters from Compton Mackenzie’s comedy classic novel. First published in 1947 and adapted into a popular Ealing comedy film in 1949, Whisky Galore tells the tale of two Scottish islands whose whisky supply has run dry due to wartime rationing. When a ship carrying 50,000 bottles of whisky shipwrecks close-by the islanders of Great and Little Todday join forces in a bid outwit the Home Guard and salvage the precious cargo. Our brand new adaptation from writer Philip Goulding (Our Gracie) is set in a cooperative hall in 1955, where we meet all-female touring troupe, the Pallas Players. Inspired by the true-story of the Osiris Players, a troupe of women who toured Shakespeare and more across Britain from 1927-1943, the Pallas Players are a fearless touring troupe lead by redoubtable Actor/Director, Flora Bellerby (Sally Armstrong). Each of the Pallas Players transforms into multiple characters throughout the show, with hilarious results. Whisky Galore runs at the Coliseum until Saturday 7 April. Tickets are available online here, by phoning 0161 624 2829 or by calling in at Box Office. Whisky Galore is a co-production with Hull Truck Theatre and New Vic Theatre. Following three weeks at the Coliseum it will embark on a national tour until 30 June. This week we’re starting rehearsals for our next production, Alan Ayckbourn’s Relatively Speaking, which will be directed by one of Ayckbourn’s long-time associates, Robin Herford. Best known as the director of the phenomenally successful stage adaptation of The Woman in Black, Robin Herford spent much of his early career working with Alan Ayckbourn at the Stephen Joseph Theatre in Scarborough and has appeared in the original production of more Ayckbourn plays than any other actor. He was appointed Associate Director at the Stephen Joseph Theatre in 1979 and was Artistic Director from 1986 to 1988, whilst Ayckbourn was Company Director at the National Theatre. In 1977, Robin performed as Greg in Relatively Speaking at the Stephen Joseph Theatre, directed by Ayckbourn himself. Robin is also one of the Coliseum’s favourite visiting directors. His last show at the Coliseum was the brilliant production of Gaslight in February 2017, and other productions include Boeing Boeing, Bedroom Farce and Sugar Daddies. The Coliseum’s production features Crispin Letts, who has appeared in hit feature films Murder on the Orient Express and Skyfall; Jo Mousley, who performed in the Coliseum’s Manchester Theatre Award winning regional premier of The Father in Summer 2017; Lianne Harvey, who won multiple awards in 2017 for her role in feature film, Bikini Blue; and Matt Connor, who was last in Oldham for the Coliseum’s Autumn 2017 productions of Oh What A Lovely War and Up ‘N’ Under. 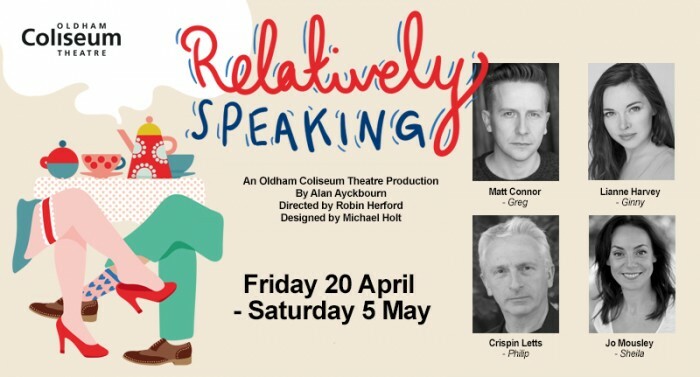 Relatively Speaking runs at the Coliseum from Friday 20 April – Saturday 5 May. Lean more and book online here. Next month, Fine Comb Theatre will take over the Coliseum’s Studio for four days, presenting Matchsticks (Thursday 19 April) and Fine Comb Conversations (Saturday 21 April). Fine Comb Theatre is a North West based theatre company that started out on the Manchester Fringe circuit in 2013. Director and Writer, Rachel McMurray, and Producer, Catherine Morefield, have established a reputation for creating stylised, innovative and intriguing productions around delicate subject matters. Matchsticks premiered at Greater Manchester Fringe 2017, where it received rave reviews and three award nominations. Inspired by a true story, it introduces us to Dani, who has been sent to prison counselling for anger issues, and her counsellor, Heather, who introduces her to matchstick modelling. What happens when two differing women find common ground in the unlikeliest of circumstances? Learn more and book tickets here. Fine Comb Conversations is an evening of four short plays that highlight subjects which are often swept under the carpet – touchy subjects, taboos and things we just don’t say… but all think. There’s A Fly In My Room is an autobiographical exploration of a young woman suffering with anxiety; Sexpectations is an unapologetic, quick-witted and humorous exploration of the expectations of women in bed; Grasshopper follows two best friends who get caught up in the dark games of gang rivalry and Measuring Up introduces three men all waiting for the same appointment. Learn more and book tickets here. Learn more about Fine Comb Theatre on their website. As part of the Coliseum’s partnership with New Charter Group and Aksa Homes, women from Greater Manchester were given backstage access to the Coliseum to help celebrate International Women’s Day 2018. On Wednesday 8 March women from Tameside, Oldham, Bury and Manchester joined us for a day of activities and a guest talk from actress Isabel Ford. Isabel is a local actress and Coliseum favourite, currently performing in the Coliseum’s brand new production of Whisky Galore. The focus of this year’s International Women’s Day (IWD 2018) is #PressforProgress and it calls on people to take action to strive for gender parity. The New Charter Homes and Aksa Homes residents were treated like VIPs with a creative session in which they recreated the International Women’s Day logo to create the concept of women coming together. The Coliseum’s partnership with New Charter Homes and Aksa Homes encourages tenants and families to try something new through regular projects which help to build confidence, employability and wellbeing. Sir Ken Dodd, “ Doddy”, appeared at the Oldham Coliseum Theatre on many occasions from the 1980s. He already had a big following, thanks to his many television and radio shows but most of the audience were to see him, live, for the first time at the Coliseum. They were amazed at the sheer drive and energy which Ken put into his live performance. He was far funnier live on stage, and interacted beautifully with all sections of the audience. They adored his big entrance, wearing his red overcoat, with tickling stick or drum to start his long first act. He always welcomed the imagined local mayor and wife with an outrageously suggestive pointing of the said tickling stick. And then we were off for hours of rip roaring entertainment which included the appearance of the famous Diddymen. When Ken first appeared at the Coliseum, he did two shows, one at 6.0pm and the next, theoretically at 8.40pm. The trouble was that the first show was so long that by the time the interval came at 8.30pm, the audience for the second show had arrived and were waiting in all the bars, staircases, anywhere they could. It made for an interesting exit of the first audience, trying to avoid the next audience as they attempted to get in. At future appearances, Ken resorted to the one show, The Happiness Show, which was the famously long almost five-hour stint, broken only by a quick interval, a couple of speciality acts and his partner, Anne Jones, who did a piano spot. He even used this House Manager to carry off his costume between parts of his act, when one noticed his hands had cue words and lines for him to refer to as he shifted the positioning of his microphone. After the show, often at 1am in the morning, Ken found time to sign souvenirs or meet long standing friends backstage as he ate his sandwiches and drink and recall his many years on the stage and his own favourite comics from the ’50s like Arthur Askey and Robb Wilton. All this and sorting out his faithful dog which also accompanied him on his stage appearances. Theatre staff would eventually wave Ken off after his show, often at 3am in the morning, but somehow, they didn’t mind. He was a unique British entertainer, who, in the words of his famous song, brought happiness to his fans near and far and the Coliseum is proud to have witnessed his presence on its stage. It’s been two years since Scribbles, the Coliseum’s writers group was founded. Since then, the group have worked with some amazing writers, including Cathy Crabb (co-writer of Dreamers and Meat Pie, Sausage Roll), and Rebekah Harrison (co-founder of Take Back Theatre Collective). This term the group have worked with writer Jayne Marshall whose work has been featured at 53Two, Waterside Arts Centre, 24:7 Theatre Festival and more. Scribbles is a friendly group where participants can share their work, meet other writers, and learn new writing techniques. It’s suitable for everyone – even absolute beginners. Last year the group collaboratively wrote Defeat the Clowns which was performed by professional actors during the First Break Festival. The next term of Scribbles starts on 25 April and will take place every other Wednesday from 11:30am – 1pm for £3 per session. If you have any questions about Scribbles, please contact Rose Sergent, Admin Officer, on rosesergent@coliseum.org.uk. For booking contact the Box Office on 0161 624 2829. This month we’re holding performances for our 2017-18 Secondary Partnership Scheme. The Coliseum’s Learning and Engagement team and mentor Rob Johnston worked with five emerging writers: Sally Angelsea, Ryan Gilmartin, Paul Holliday and Rose Sergent to create ten minute pieces responding to the themes of friendship, growing up and self-belief. The work has been performed by schools across Greater Manchester, each providing a different perspective. The Secondary Education Partnership Scheme enables young people to become immersed in a range of creative processes, by building knowledge and understanding in all aspects of producing theatre and gives them the opportunity to perform on the Coliseum’s main stage. The Education Partnership Scheme is supported by the Andrew Lloyd Webber Foundation, providing opportunities for schools to develop long-term meaningful links with theatre. I have worked at the Coliseum for ten years. I started in Box Office, and in May last year I joined the Admin team. I really enjoyed Brassed Off, which we produced in 2008 and again in 2016. I love a good brass band! It’s great fun working in a theatre. I particularly enjoy casting, which involves speaking to agents, preparing for auditions and then finally seeing the actors on the stage. I’m finalising the programme for Full Circle, which is a fortnightly group here at the Coliseum for people aged 50 and over. In work, I am particularly looking forward to seeing A Taste of Honey by Shelagh Delaney, which opens in May. We have recently held auditions and I can’t wait to see who has been cast! Outside of work, I am excited about my upcoming trip to Wales. I love rodents! I have two guinea pigs, Treacle and Zebedee, and a hamster called Heidi. They all have their own little personalities, especially Heidi, who is a little diva! We’re on the lookout for friendly and reliable people to join a welcoming and diverse team in a busy and varied volunteering role. Volunteering at the Coliseum offers a range of opportunities including: meeting new people, developing customer service skills, experiencing professional theatre up close and ensuring all of our visitors have an exceptional time. Customer Experience Volunteers help to look after our audiences from the moment they arrive at the theatre until the moment they leave. Dan Herman began at the Coliseum as a Customer Experience Volunteer and went on to become a Front of House Assistant for Sleeping Beauty. He then worked abroad as an entertainer with Live Business/TUI and returned to the Coliseum as a member of the Bar Staff. We’ll be holding a training session on Thursday 12 April for all new members of our team. To download an expression of interest form, click here or email any queries to Anna Hughes, Admin Assistant at annahughes@coliseum.org.uk. Please return your Expression of Interest from by Wednesday 4 April.